The Geode Creek pack formed in March 2002 when a female from the Druid Peak pack (106F) dispersed and joined 5 uncollared and unknown wolves. A large male described as ‘husky’ became the alpha male of this pack. While the pack had 10 pups in their first year, only 3 survived to the end of the year and 2 survived until the following March. In January 2003, the alpha male was radio-collared (294M) but died in April of the same year due to interspecific conflict (killed by other wolves). The new alpha male was captured in 2005 when biologists identified him as wolf 227M, originally from the Yellowstone Delta pack. He dropped his original collar in 2001 but was identified by a pit-tag (similar to what is used to identify pet dogs and cats). This type of identification can clearly add to biologists’ ability to track individual wolves throughout their lifetime. Three more Geode Creek pack wolves were radio-collared in 2004, including 353F, 391F, and 392M. 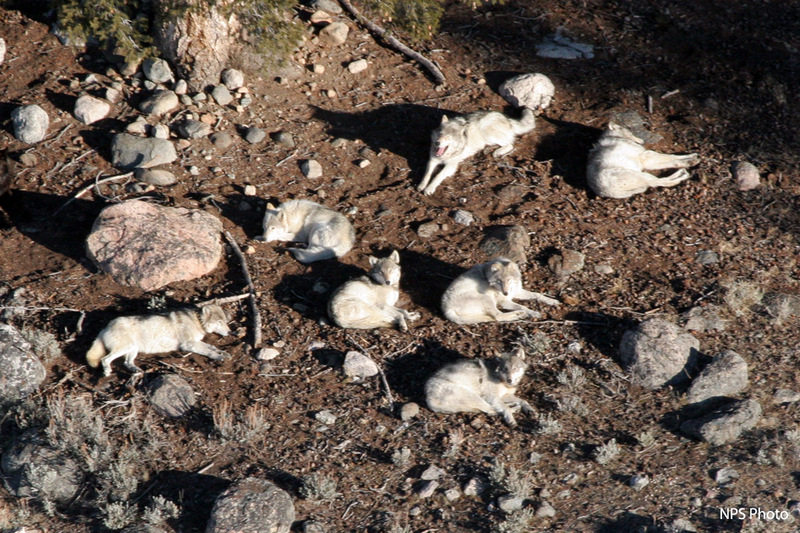 This pack became quite prolific, having successful dens in 2002, 2003, and 2004. In 2005 however, no pups emerged from the den. Of the three remaining collared wolves in the pack, two died (483F and 488M) and one’s collar failed (374M). The pack apparently dissolved with no wolf sign subsequently found in the Geode Creek area.